The authentic all terrain. Very comfortable thanks to the active suspension and large diameter wheels. 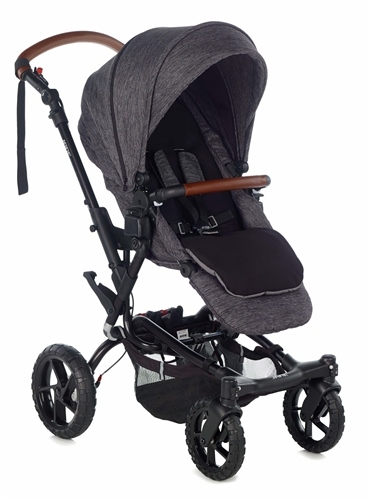 Crosswalk R is the new high performance all terrain pushchair with a compact folding system. Its cool design makes it ideal for the city and its strength with the suspension makes it the perfect pushchair for the country. And what’s more, its large size wheels with independent shock absorbing suspension and the aluminium tubular chassis make it really hard-wearing and safe, while giving it its own unique and very appealing style. Large all-terrain wheels with Hydrolytic PU tyres are puncture proof and 10 times more hard-wearing than traditional pushchair tyres. These wheels combined with its inverted 'C' shaped chassis gives plenty of clearance for true off-road adventures. The Jané CROSSWALK R pushchair has the Pro-fix system built-in, and the following infant car seats and carrycots are compatible to convert the CROSSWALK R into a travel system or pram.